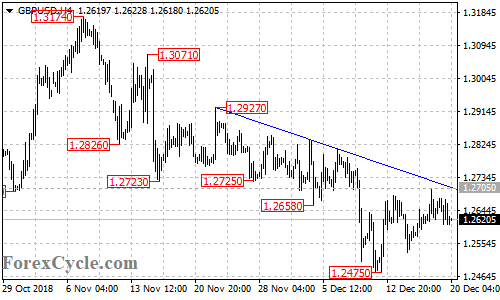 GBPUSD failed to break above the falling trend line on the 4-hour chart, suggesting that the pair remains in the downtrend from 1.3174. As long as the trend line resistance holds, the bounce from 1.2475 could be treated as consolidation for the downtrend. Another fall towards 1.2475 would likely be seen in the coming days. Only a clear break above the trend line resistance could signal completion of the downtrend.